Computer screen shows the Ivanka Trump logo, right, and the website of the Chinese Trademark Office in Beijing, China, Monday, May 28, 2018. China has approved 13 Ivanka Trump trademarks in the last three months and granted provisional approval for eight more, raising fresh conflict-of-interest questions about the White House. 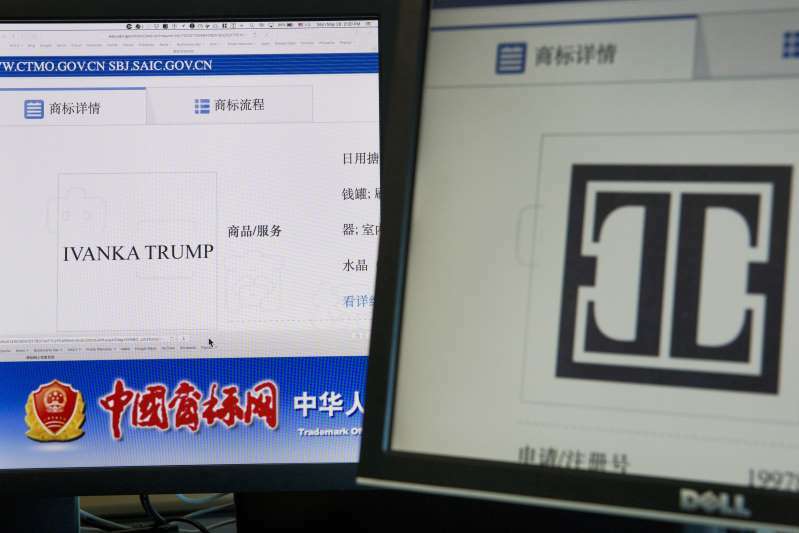 (AP Photo/Ng Han Guan) © The Associated Press Computer screen shows the Ivanka Trump logo, right, and the website of the Chinese Trademark Office in Beijing, China, Monday, May 28, 2018. China has approved 13 Ivanka Trump trademarks in the last three months and granted provisional approval… More approvals are likely to come. Online records from China's trademark office indicate that Ivanka Trump's company last applied for trademarks — 17 of them — on March 28, 2017, the day before she took on a formal role at the White House. Those records on Monday showed at least 25 Ivanka Trump trademarks pending review, 36 active marks and eight with provisional approval.